In this new book* Rosenzweig extends the work of Kahneman and other scholars to consider real-world decisions. He examines how the content and context of such decisions is significantly different from controlled experiments in a decision lab. Note that Rosenzweig’s advice is generally aimed at senior executives, who typically have greater latitude in making decisions and greater responsibility for achieving results than lower-level professionals, but all managers can benefit from his insights. This review summarizes the book and explores its lessons for nuclear operations and safety culture. Can the outcome following the decision be influenced or controlled? Think about your senior managers. Do they under or over-estimate their ability to influence future performance through their decisions? Is the performance based on the decision(s) absolute or relative? Absolute performance is described using some system of measurement, e.g., how many free throws you make in ten attempts or your batting average over a season. It is not related to what anyone else does. But in competition performance is relative to rivals. Ten percent growth may not be sufficient if a rival grows fifty percent. ** In addition, payoffs for performance may be highly skewed: in the Olympics, there are three medals and the others get nothing; in many industries, the top two or three companies make money, the others struggle to survive; in the most extreme case, it's winner take all and the everyone else gets nothing. It is essential to take risks to succeed in highly skewed competitive situations. Absolute and relative performance may be connected. In some cases, “a small improvement in absolute performance can make an outsize difference in relative performance, . . .” (p. 66) For example, if a well-performing nuclear plant can pick up a couple percentage points of annual capacity factor (CF), it can make a visible move up the CF rankings thus securing bragging rights (and possibly bonuses) for its senior managers. Do your senior managers compare their performance to some absolute scale, to other members of your fleet (if you're in one), to similar plants, to all plants, or the company's management compensation plan? Will the decision result in rapid feedback and be repeated or is it a one-off or will it take a long time to see results? Repetitive decisions, e.g., putting at golf, can benefit from deliberate practice, where performance feedback is used to adjust future decisions (action, feedback, adjustment, action). This is related to the extensive training in the nuclear industry and the familiar do, check and adjust cycle ingrained in all nuclear workers. However, most strategic decisions are unique or have consequences that will only manifest in the long-term. In such cases, one has to make the most sound decision possible then take the best shot. How about your senior managers? Do they tell the whole truth when they are trying to motivate the organization to achieve performance goals? If not, how does that impact trust over the long term? There is a good discussion of the overuse of the term “overconfidence,” which has multiple meanings but whose meaning in a specific application is often undefined. For example, overconfidence can refer to being too certain that our judgment is correct, believing we can perform better than warranted by the facts (absolute performance) or believing we can outperform others (relative performance). Rosenzweig conducted some internet research on overconfidence. The most common use in the business press was to explain, after the fact, why something had gone wrong. (p. 85) “When we charge people with overconfidence, we suggest that they contributed to their own demise.” (p. 87) This sounds similar to the search for the “bad apple” after an incident occurs at a nuclear plant. There is a good extension of the discussion (introduced in Kahneman) of base rates and conditional probabilities including the full calculations from two of the conditional probability examples in Kahneman's Thinking, Fast and Slow (reviewed here). Rosenzweig acknowledges that he is standing on the shoulders of Kahneman and others students of decision making. But “An awareness of common errors and cognitive biases is only a start.” (p. 248) The executive must consider the additional decision dimensions discussed above to properly frame his decision; in other words, he has to decide what he's deciding. The direct applicability to nuclear safety culture may seem slight but we believe executives' values and beliefs, as expressed in the decisions they make over time, provide a powerful force on the shape and evolution of culture. In other words, we choose to emphasize the transactional nature of leadership. In contrast, Rosenzweig emphasizes its transformational nature: “At its core, however, leadership is not a series of discrete decisions, but calls for working through other people over long stretches of time.” (p. 164) Effective leaders are good at both. Of course, decision making and influence on culture is not the exclusive province of senior managers. Think about your organization's middle managers—the department heads, program and project managers, and process owners. How do they gauge their performance? How open are they to new ideas and approaches? How much confidence do they exhibit with respect to their own capabilities and the capabilities of those they influence? Bottom line, this is a useful book. It's very readable, with many clear and engaging examples, and has the scent of academic rigor and insight; I would not be surprised if it achieves commercial success. 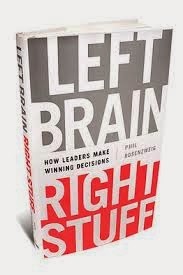 * P. Rosenzweig, Left Brain, Right Stuff: How Leaders Make Winning Decisions (New York: Public Affairs, 2014).